With numerous cat feeding bowls ranging from ceramic, plastic and stainless steel bowls in the market. The material you settle for is crucial. If your cat is aggressive and playful, play it safe with plastic bowls. You can start with a bunch of simple plastic stacking bowls that will do the trick. Do not even think about anything breakable, since bowl-tossing will be your cats’ favourite sport as he enjoys spilling his food when cheeky. There are so many products in the market now to assist with your pet mealtime wares. Here is all you need to know about selecting the best pet safe, approved cat ware. When you bring your kitten/cat home it might act a bit crazy and independent, this might be the time to get her feeding bowl to enable her eat and drink more efficiently and with less mess. Select a bowl that you feel will suit your cat’s needs, as well as yours. Making mealtimes fun and aids your cats growth development. You might argue a bowl is just a bowl, but material matters and your pet’s bowl is a critical product, since he or she will eat and drink out of it multiple times a day for his or her entire life. Clearly, buying the wrong bowl could put the health of your pet at risk and also cost you your investment. Comsmart bowl is made of high quality stainless steel, perfect for cats and kittens. The individual capacity of each bowl is up to 8 ounces, perfect for dry, wet food and water. Safe for your cat as it is non-slip so your cat does not crash and mess up the floor. Comes in good size, not so high for the cat to get the meal easily. Great for a household of multiple pets as it comes in vibrant color with cute cats painted. Suitable for your pet dogs, cats, puppies and kittens to use. Perfect for holding dry kibble, wet food, treats, or water. Easy to clean and convenient for you. The stainless steel material ensures that the cat bowl can use for a long time and not easy to rust. High quality material of this pet bowl makes it bite resistant, shatter proof and non-toxic for your pets. Hand washing safe for cleaning, or rinse it in clean water and let it air dry and also the rubber ring can be taken off to clean the gap. The Catit Feeding bowls have a stylish design which fits any home interior. Easy to clean with a removable stainless steel dish. Well-crafted and designed to keep your cat’s whiskers untouched for a comfortable, stress-free eating experience. This dual-purpose feeding dish is suitable for wet and dry food also. Contains two hygienic, removable stainless steel dishes. Double bowl makes feeding and watering your small pets easier. Durable holder with non-skid feet. One larger bowl for 350ml and a smaller bowl for 160ml to suit different cat sizes or as your cat grows. Works as a full dinner set with food and water for one. Perfect for small-sized pets. 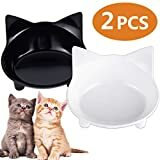 Comes with a silicone stand that keeps the bowl from skidding on the floor and slide all over the place when your cat is eating keeping room clean, as the extra large base catches any spills . Works as a full dinner set with food and water for one, each holds 12 oz. Perfect for small-sized pets: cats, puppies, small-sized dogs, Chihuahua, poodle, pug, papillon, BEAGLE, Basset Hound, and Yorkshire etc. No-spill silicone mat catch all spills. Made of high quality stainless steel which is rust resistant. Both silicone stand and stainless steel bowl are dishwasher safe. Neat, attractive and convenient feeding stations for your pet. Free food scoop/shovel for easy fetch when your pet needs to eat. Pet lovers can now get a collection of beautiful ceramic bowls for their cats/dogs daily meals. If you are creative a twist of inspiration can aide to make a beautiful bowl in a pottery class for your feline friend. Get a lovely handmade stoneware or ceramic bowls as a gift for your pet this time round. To make an impact, ceramic feeding bowls exert a level of quality and enhance your feline friend meal experience. Why you would consider ceramic feeding bowl over the rest? Ceramic does not leak chemicals when exposed to high heat in microwave or traditional ovens, broilers or plate warmers. No health hazards occur from serving piping hot food on ceramic, just let food cool prior to serving your cat to avoid burning it. For cooking or serving hot food and for effective cleaning, ceramic has qualities that make it a superior product. Great quality as ceramic is microwave and dishwasher safe making it easy to use and clean. We love stylish bowls, and with Catkins say goodbye to your noisy cat stainless steel bowl as it hits the floor. It is also easy to use and clean and I love that it comes in an encrypted cat print for a special feel to your cat. 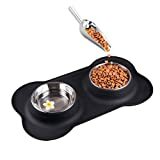 Excellent value for money, stylish, durable and practical as it comes in a good size and therefore can be used for years to come as your cat grows and wants larger portions. The bowl is also reasonably deep, making spillages less likely. Durable ceramic bowl ideal for both food and water. Keeps food and water cooler for longer time. Weighted bowl not easily tipped over. Unique cat design add to home décor. Ideal bowl to feed your cat. Adorable bowls, good quality and comes with a stand making it easy as your cat eats in a better position without straining. The black metal stand is powdered coated and does not slips due to its rubber feet. Easy to clean as it can be washed in the dishwasher or just wiped over making it easy for you. Very attractive 2 ceramic bowls with stand. The stand prevent the pets from overthrowing the bowls and great health help for the pet’s shoulder and neck. Powder coated black metal stand. Can be for multi-used, for food and water. High temperature resistant cat bowls ceramic, non-toxic harmless, no smell, can be placed in the dishwasher and is beautifully engraved with a fish design to entice your cat. The feeding bowl is finished using nontoxic paint so that maximum safety for the pet is ensured when used for either food or water,also can substitute a water fountain. Cat bowls with interesting pattern design, not easy damaged, appearance beautiful, delicate. Suitable for cats and small dogs as the feed is ample. High temperature resistant cat bowls ceramic, non-toxic harmless, no smell. Dishwasher and hand wash safe. Neutral design to blend with home interior. Easy to clean unlike plastic bowls. Stainless steel bowls might be durable and long lasting but very noisy if kicked around by your pet. Ceramics have a beautiful appeal but might put you off due to heaviness, if you are a pet owner who travels a lot with your feline and furry friends. Plastic is light weight and portable which can be the best choose when shopping around for a cat feeding bowl. It will need thorough cleaning as it can harbor bacteria in the cracks and scratches from your cats’ claws causing a health risk. One can buy melamine bowl which is hard plastic for a change. This cute cat-shaped cat feeder stand contains two bowls with a stand absolutely perfect for cats. No more messy kitties in your kitchen. Pets can eat in style with these funky lightweight plastic feeding bowls. Super strong deep bowls with non-slip feet, good quality and easy to clean. Ideal for dry and wet food. Great for Cats, Kitten, Kitty, Small Dogs, Rabbits, Ferrets, Guinea Pigs and other Pets. Patented shallow and angled shaped bowl allows your cat to get the food easily, which prevents whisker fatigue and keeps his/her face clean. Perfect width to allow an adult cat’s whiskers sufficient “breathing room” near the bowl’s sides yet still allow the bowl’s contours to keep the food from sliding away while eating. Even with constant accidental kicks from your cat no breakage making them long lasting. Made from BPA free melamine, non-toxic, non-allergic. Full dinner set – set of 2 bowls works as a full dinner set with food and water for one. With the Non Skid 4 legs on the bottom of the bowl, you will never worry that the bowls slide all over the place when your cat is eating. Each bowl holds up to 8-ounce or 1 cup and you will not overfeed your pet. Suitable for wet food, dry food and water. Adorable stylish to be your home decoration. You can rest assured that when your pet is enjoying food or water from one of these bowls they are completely safe from toxins. 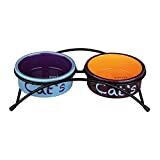 Affordable, simple pet bowl perfect for dry food, wet food and water for your lovely pet. Round bowl design facilitate easy containing of food and water, easy cleaning and filling. Perfect for dry food, wet food and water for your loved pet. Suitable for cats and small pets. No more unwarranted pet, eating up your cat yummy meal when indoor. Efficient bowl for both pet and owner as the bowl has a motion-activated lid that opens when any pet approaches and once done with eating the lid closes when it goes. Costly but worth the investment as it keeps food fresh and clean as lid keeps away flies and bugs. Sealed bowl keep food fresh and clean, and avoid contamination from flies and insects. Makes food palatable as it keeps it moist. Ideal for dry or wet food. Bowl is not microchipped or collar tag operated hence it can open for any pet. Operated by use of batteries, bought separately. Do not be worried about your pets making your room so dirty and wetting your floor after their tasty meal. With a secluded meal place your pets will not move the bowl, just make sure they are familiar with their eating area. 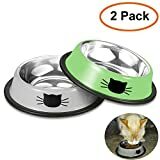 A household with two or more pets will not be a problem anymore as dual feeding bowls are best as you can now feed them at the same time. The bowls above have taken care of all your queries from time constraints, it might be boring to clean the bowl after feeding your cat but with dishwasher safe bowl all this has been catered for. Plastic bowl are great for travel as they are portable. When the appearance of your cat feeding bowl is the primary concern, ceramic has a beautiful appearance and will attractively decorate your cats feeding space. We have included the best in our picks above. Only caution will be consider ceramic bowl breaks easily when it lands on a hard surface when you are shopping for a long lasting ware.